It really came as no surprise when Ratatouille won the Oscar for best animated film of the year in 2008. After all, this movie is one of the best to come out from Pixar. The movie is extremely enjoyable, funny, and sentimental all at the same time. For a project like this one the music required all of those energetic phrases found in other Disney movies, plus some French elements and originality. Michael Giacchino, who had composed the score for The Incredibles, was hired to do just that. Of course, the results were simply terrific. This score breaks away from many of the usual scoring conventions found in animated movies and creates a score that has a great degree of originality, while still maintaining the right amount of French music clichés. “Le Festin” is the first track on the album and is a very nice introductory song. The chord progressions are very mellow, sweet, and extremely appropriate for the required mood of this movie. Admittedly, I couldn’t understand the song itself, yet the vocals are clear and very beautiful. A few tracks are fairly short in duration, thus having many musical fragments that never connect with one another. Still, some of the first tracks like “Granny Get Your Gun,” “100 Rat Dash,” and “This is me”, offer very interesting musical moments. “100 Rat Dash” is an exhilarating piece that contains both dramatic and humorous moments within it. Let me say that in all of these tracks the instruments’ ranges and timbres are very well used, hence making the orchestrations sound very solid and full. In “Wall Rat,” for instance, the flutes have those "pseudo Jean-Pierre Rampal riffs" that are outstanding. Eventually, this piece evolves into a very sentimental piece that gradually begins to emulate George Fenton’s jazzy scores for romantic comedies. “A Real Gourmet Kitchen” is, in my opinion, the best track of this album. This track contains elements that Giacchino used in his Medal of Honor scores. Moreover, he still uses accordions, guitars, among other instruments to try to keep the style focused on the French theme. Although at times this track has a more militaristic sound to it, the variations force the music to explore different harmonies, taking it through different styles of music. Understandably, the constant use of accordions and minor chord progressions might upset some people — particularly those tired of clichéd French music. However, tracks like “A new Deal” offer a wonderful listening experience that is romantic and melancholic at the same time. One is destined to become immersed in this music and believe they are taking a trip through France. “Remy Drives a Linguni” has some of the same characteristics. In this track we get to hear some wonderful harmonica lines, combined with whistling, beautiful guitars, and muted trumpets. This is one track where we really get to experience some beautiful themes by Giacchino. “Special Order” and “Collete Shows him le Ropes” have more of latin flavor to it — Tango, anyone? Yet the listening experience is superb. Giacchino proves that he can write some fabulous lines with complex rhythms and a variety of instruments. One can’t help but notice some elements of The Incredibles in “Losing Control” and “The Paper Chase,” which I think reinforce the idea that Giacchino has mastered the art of providing jazzy scores for animated films. These two tracks are as exciting as they get — and quite enjoyable too. In “Heist to See You” we hear again that bassoon/clarinet theme we heard early on. More importantly, it is in this track that we start to notice a little bit of Scott Bradley’s influence on Giacchino’s work. After all, Bradley was the undisputed master of cartoon scoring — even though many will argue in favor of Carl Stalling. Nevertheless, Giacchino does a wonderful job of having tracks that do not depend on “Mickey Mousing” — or “Remy Mousing” in this case. “Remy’s Revenge” sounds very much like one of the major themes in Medal of Honor. In fact, it becomes indistinguishable at times; but, having said that, this piece evolves into a soft piece with beautiful themes that are very powerful and emotional. The five-note motif and overall orchestrations in “Dinner Rush” are brilliant. Not once in this piece does Giacchino become dependent on using the accordion or any other instrument; instead, he makes extensive use of the entire orchestra and creates a piece that is truly splendid. By the time the “End Creditouilles” roll around, you will be whistling many of the themes. The “End Creditouilles” just blew me away. You’ll have to experience this by yourself, but let me say that this almost ten minute track contains so many jazz elements that you will be wondering how all of them got combined. Also, 95% of the musical elements you’ll hear in this track are not necessarily found elsewhere on the CD. The last track “Main Theme,” is an excellent reminder of the beautiful themes found in this score. I’m sure many people will look for the piano sheet music after listening to this track — I hope it’s published somewhere. Overall, this score is fantastic. Giacchino does a terrific job on this one, ultimately resulting in his first Academy Award nomination. The instrumentation, themes, and orchestrations are perfect for this movie. Arguably, we do get those cliché musical moments that are to be expected in scores like this one (sometimes they will remind you of Henry Mancini’s music), but even so, Giacchino develops these “clichés” into innovative pieces that are worthy of reverence. Perhaps Giacchino has not achieved the stature of great modern animation composers like Alan Menken, but believe me, he does have the potential of becoming one of the greatest in that department. Hence, whether you are a Michael Giacchino fan or not, this is, unquestionably, one CD that you should have in your collection. It's hard to believe that it's been three years since Michael Giacchino took to the Pixar recording studio to musically usher in The Incredibles to movie theatres. Brad Bird's Pixar movies are unlikely to become the highest grossing the studio has to offer even if they are some of the best - but then again, it's all relative. His follow up is a complete change of tack, following a trainee chef as he strikes up an unlikely culinary alliance with a gastronomic rat. If nothing else, the title is wordplay genius (and yes, as it says on the posters, it's pronounced rat-a-too-e for those unfamiliar with continental vegetable dishes). His score to Mission: Impossible 3 was more of a fine technical exercise than anything else, but Ratatouille is Giacchino back to his melodic and more heartfelt best. Being set in Paris, the accordion is never far away, but the composer draws inspiration from a wider source than merely instrumentation. The main theme is introduced Le Festin, a song so convincingly authentic that it could be an old standard. Mind you, the delivery by Camille is rather sweet; Edith Piaf she ain't (possibly a good thing, but then, je ne regret rien...). With a certain inevitability, the Marseillaise kicks off Welcome to Gusteau's before launching into the first of many delightful variations on the main theme, here performed on accordion. It seems churlish to complain that so many Francophone cliches are present throughout, but in fairness to Giacchino, he makes most of them his own. Several reviews have noted the influence of Georges Delerue - a natural starting point - and that's true, up to a point, although more the light jazz end of Delerue's output, than his more opulent string themes. Although there are hints of Delerue, the jazz of Claude Bolling is an even stronger precedent, although Bolling is less well known to the film music community (despite having scored over a hundred films in his career). The flute writing of Wall Rat and Losing Control, in particular, evokes Bolling's California Suite (well worth checking out if Ratatouille peaks your interest for that kind of lightly hewn jazz), but mixing it with a dash of Carl Stalling orchestral fireworks. Giacchino's way with more up tempo scoring (I'm loathed to say 'action scoring' in this context) keeps getting better and better, the highlight here being the five minutes of Dinner Rush. The cue is anchored by a descending fanfare that wouldn't sound out of place in a Mahler symphony, but I doubt even Mahler would have given it to an accordion. However, when belted out by the horns it's a grand gesture indeed, the only disappointment being that it doesn't occur elsewhere in the score. The End Creditouilles are arranged very much like those for The Incredibles, a boisterous jazz melange of the score's major material, but I must admit that I would have preferred something a little lighter that emphasized the gentler jazzy elements and the more romantic aspects of the score. However, the two minute arrangement of the main theme is a nice coda to the score as a whole. 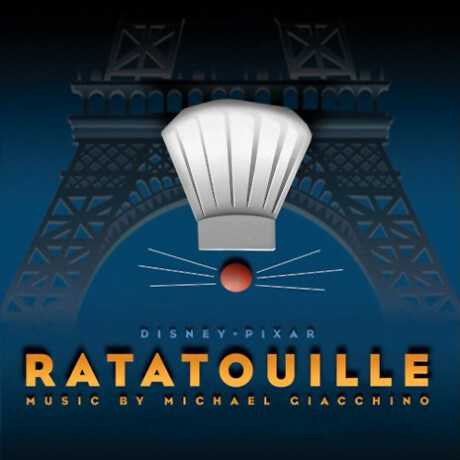 In a fairly lackluster summer of movies and scores, Ratatouille stands out as one of the strongest releases and another nice addition to Giacchino's filmography.